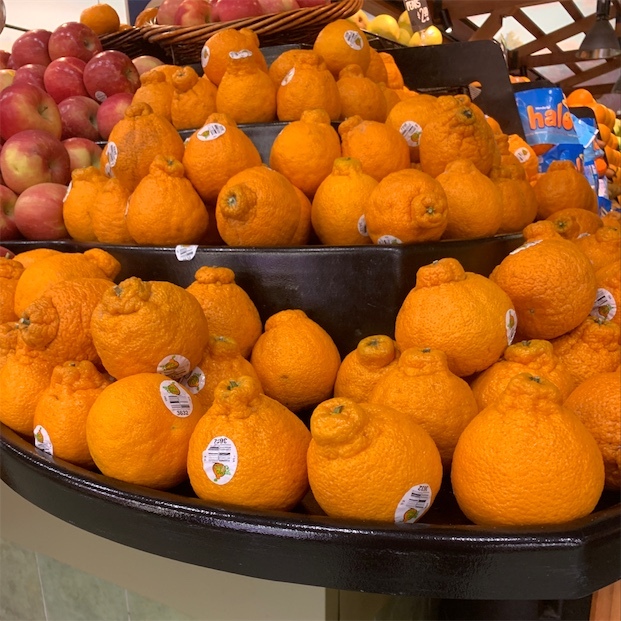 Sumo Citrus® is large in size, slightly bigger than a navel orange, and is oval to pear-shaped with a distinct protrusion at the stem end known as a top knot. The thick rind is pale orange and can range in texture from semi-smooth to roughly pebbled with many prominent oil glands that contain fragrant essential oils. The rind is also loosely attached to the flesh creating an easy-to-peel nature, and underneath the surface, the spongy, white pith is very thin, edible, and almost nonexistent. 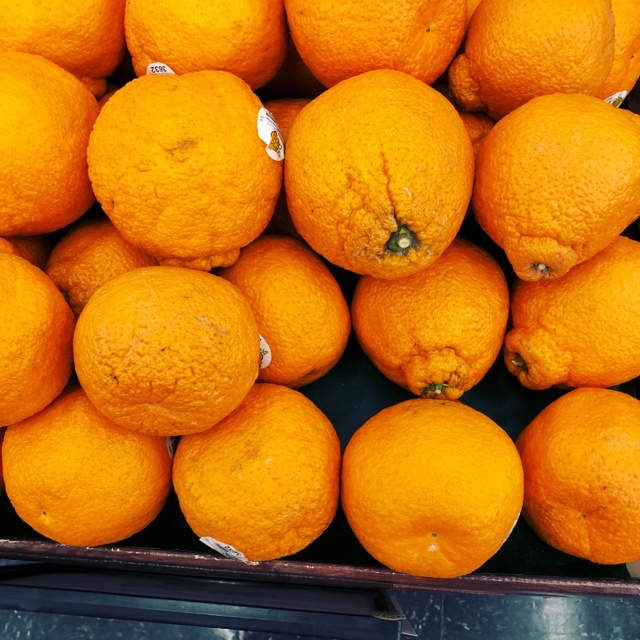 The flesh is orange, juicy, seedless and divided into 10-11 segments by thin membranes. Sumo Citrus® is aromatic, easily segmented, and sweet with a mild, tart flavor due to a low-acid content. 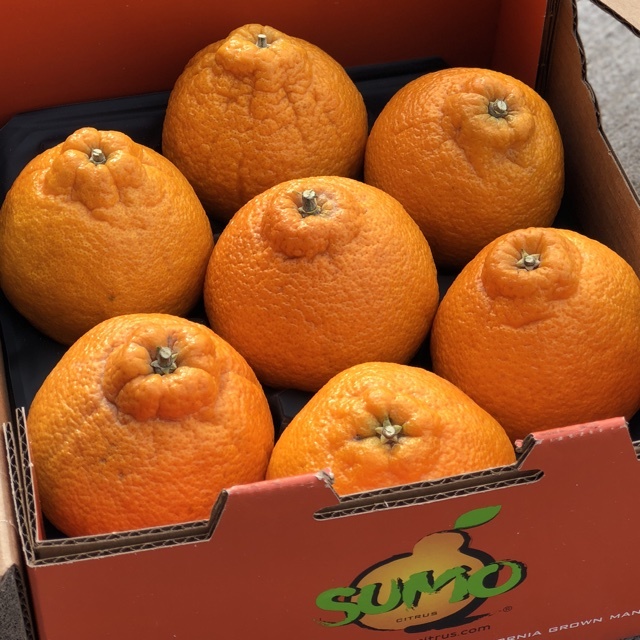 Sumo Citrus® is available for a limited season in the late winter through spring. 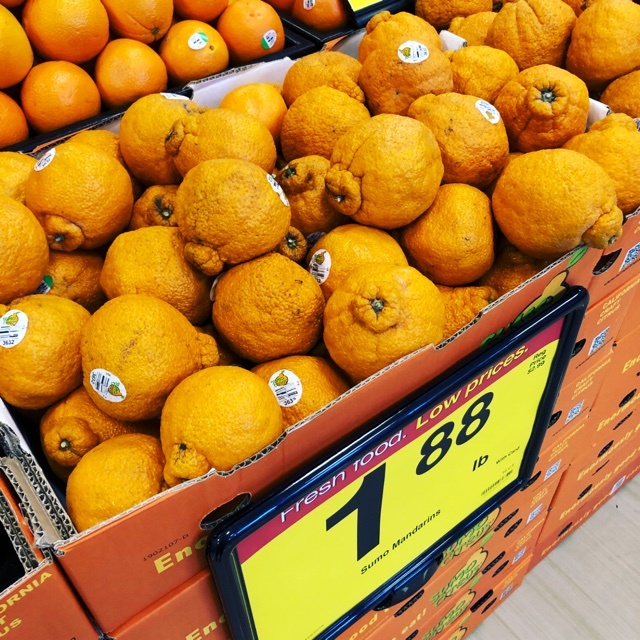 Sumo Citrus®, botanically classified as Citrus reticulata ‘Shiranui,’ is a large variety of Japanese mandarin that belongs to the Rutaceae or citrus family. 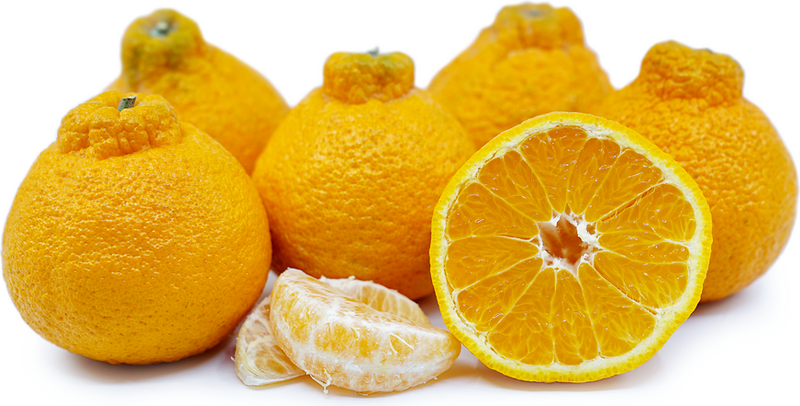 In Japan, the fruit is registered under the name Dekopon, with Sumo Citrus® being the commercial name used in the United States. 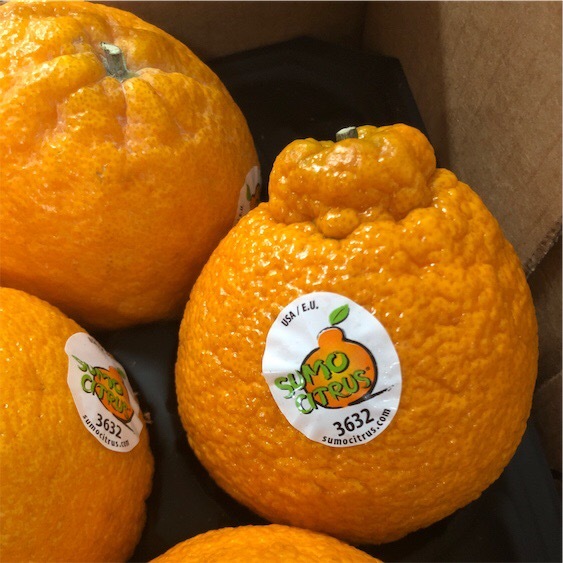 Sumo Citrus® is an intentional cross between the kiyomi tangor, which is a hybrid of an orange and a mandarin, and a ponkan, a seedy citrus from India. Developing a new hybrid in response to increased pressure to diversify the Japanese citrus industry, Sumo Citrus® is a labor-intensive variety that is required to be harvested and packed by hand as the fruit’s skin is easily bruised. Though the citrus requires more attention and care, the variety helped open export markets for Japanese citrus. 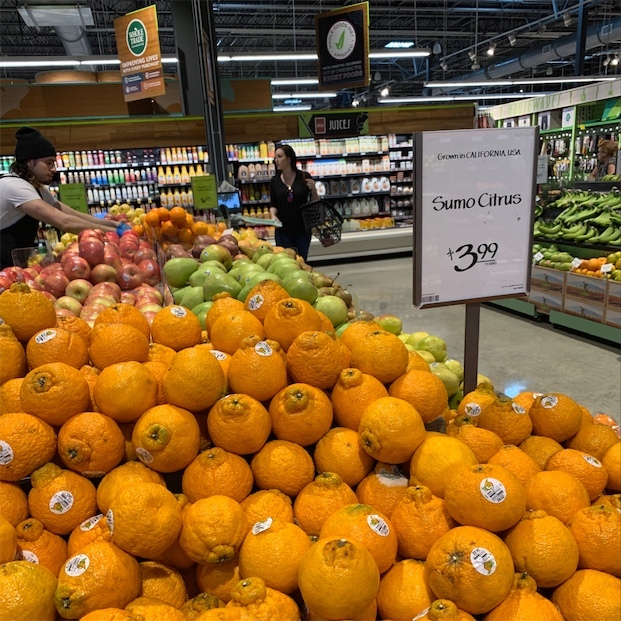 Sumo Citrus® are highly regarded for their balanced flavor and large size, consumed fresh, juiced, or zested for a wide variety of culinary applications. Sumo Citrus® is a good source of vitamin C, folate, dietary fiber, and potassium. Sumo Citrus® is best suited for raw preparations and can also be used to flavor baked goods such as tarts, cakes, cookies, and creme brulee. The fruit can be easily segmented and tossed into green salads, fruit bowls, smoothies, dipped in chocolate, consumed as a stand-alone snack, or garnished over cooked meats. Sumo Citrus® is best served as a supreme, which is a segment with the thin membrane covering each section removed. The juice and zest can also be used to flavor fudge, cheesecake, and cookies or used as flavoring in agua fresca and fresh juices. Sumo Citrus® pairs well with coconut, cucumber, apple, pineapple, banana, cantaloupe, mango, meats such as poultry, steak, pancetta, and pork, seafood, pine nuts, pistachios, cashews, pumpkin seeds, mild cheeses, chiles, avocado, asparagus, green beans, corn, limes, basil, shallots, and risotto. The fruit will keep up to four days at room temperature and 2-4 weeks when stored in the refrigerator. Sumo Citrus® was given its name for its size, top knot, and Japanese heritage. 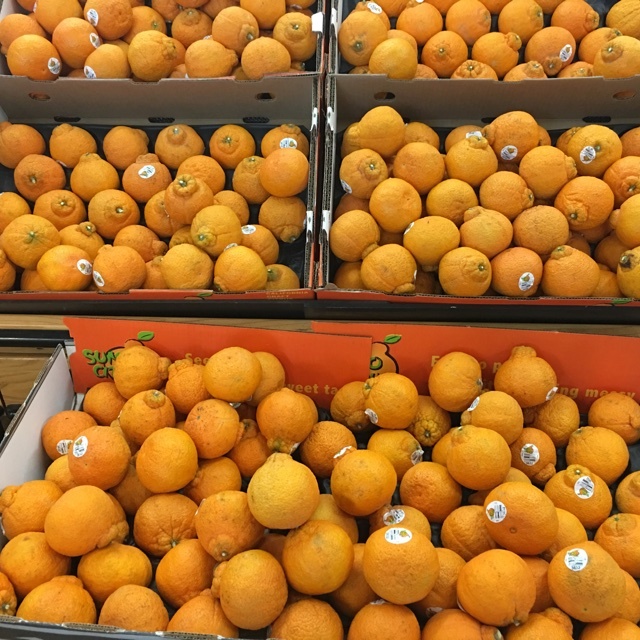 To appeal to American markets, cultivators determined that the fruit’s unique name pays homage to one of the beloved sports in Japan and recognizes the variety as one of the largest mandarin cultivars available. It is also fitting, since the characteristic bump, or top knot, resembles the traditional hairstyle worn by Sumo wrestlers. Sumo Citrus®, or known as Dekopon in Japan, is often given as gifts between friends and has become a specialty flavor in Japanese Hi-Chew candies. In Japan, there was even a “Dekopon day” on March 1st in 2006 to commemorate the anniversary of the first shipment of the variety. 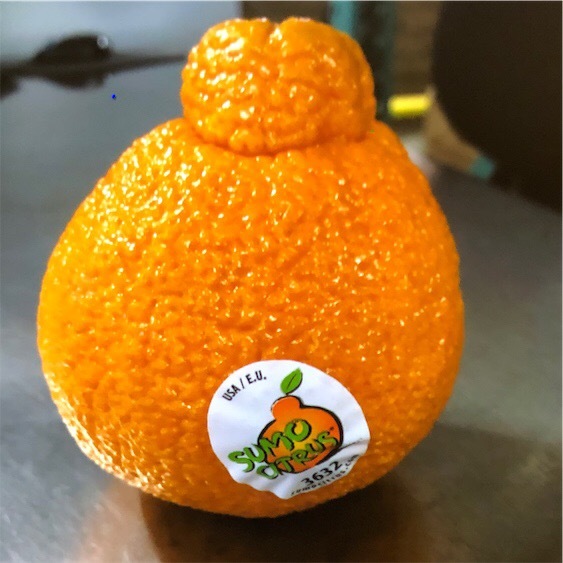 Sumo Citrus® was first developed under the name Dekopon in Japan in 1972 and is the result of thirty years of selective breeding at the government fruit research station in the Nagasaki Prefecture. Dekopon was first commercially released in Japan in 1979 and is a registered trademark with strict brix, or sugar content, and acidity standards. Budwood was imported from Japan to California in the early 2000s, where growers began cultivating the citrus in secret. It wasn’t until 2011 when California farmers were successfully growing crops that they introduced the citrus under the trademarked name, Sumo Citrus®. Dekopon trees were also exported to Korea and Brazil, where Japanese-born farmers have successfully grown the citrus since the 1980s. 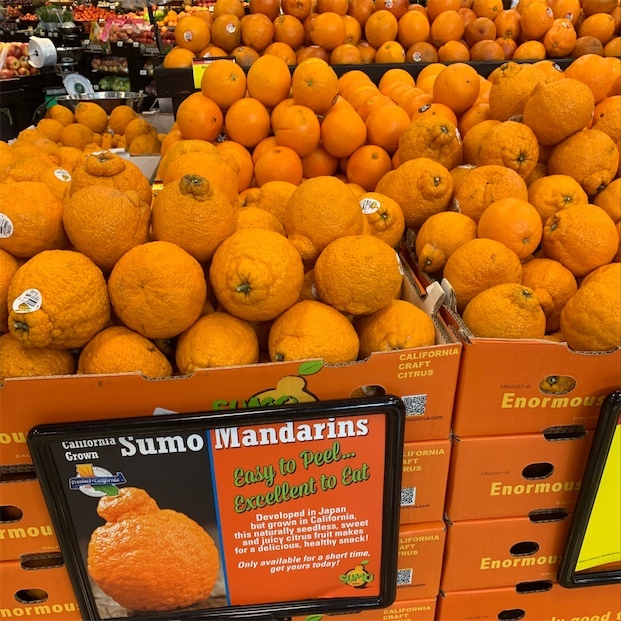 Today Sumo Citrus® is available at specialty grocers and farmers markets in the United States, Asia, especially in Japan and Korea, Australia, and Brazil. Recipes that include SUMO CITRUS®. One is easiest, three is harder. 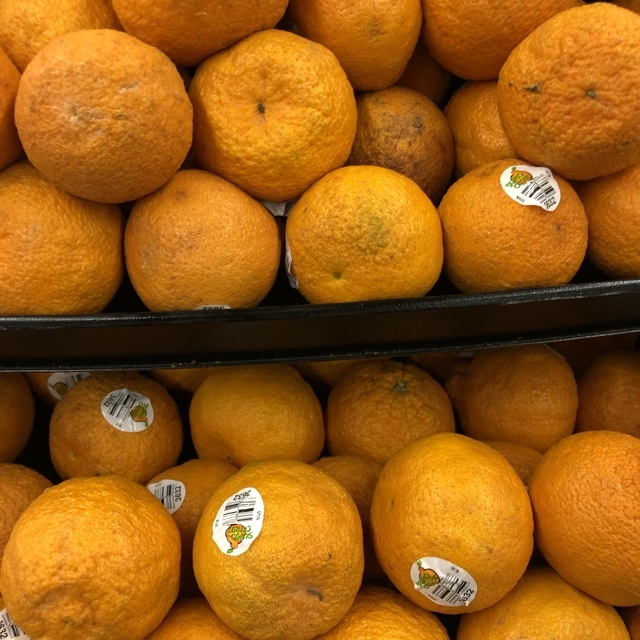 People have shared SUMO CITRUS® using the Specialty Produce app for iPhone and Android. Sharer's comments : Sumo everywhere ! Sharer's comments : Fresh Sumo! Sharer's comments : Sweet, easy-to-peel, and juicy! 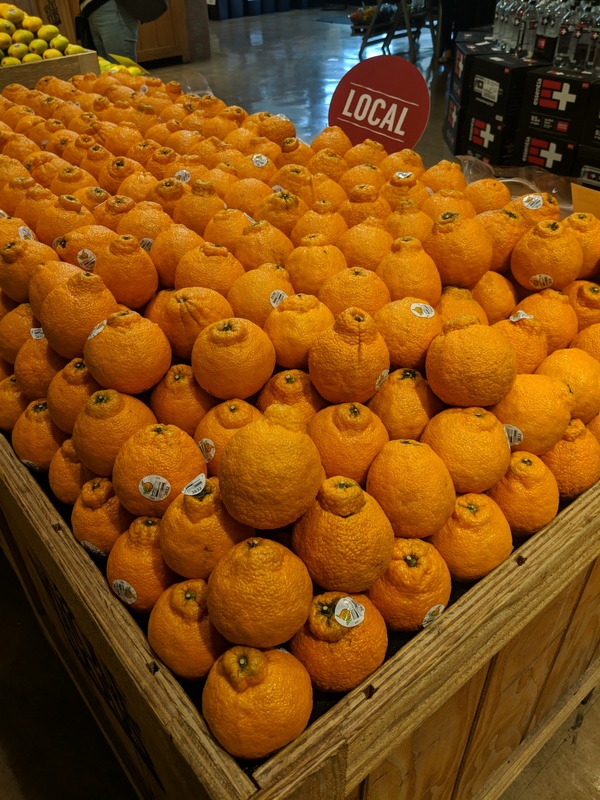 Sharer's comments : SUMO CITRUS® spotted at Sprouts Farmers Market. 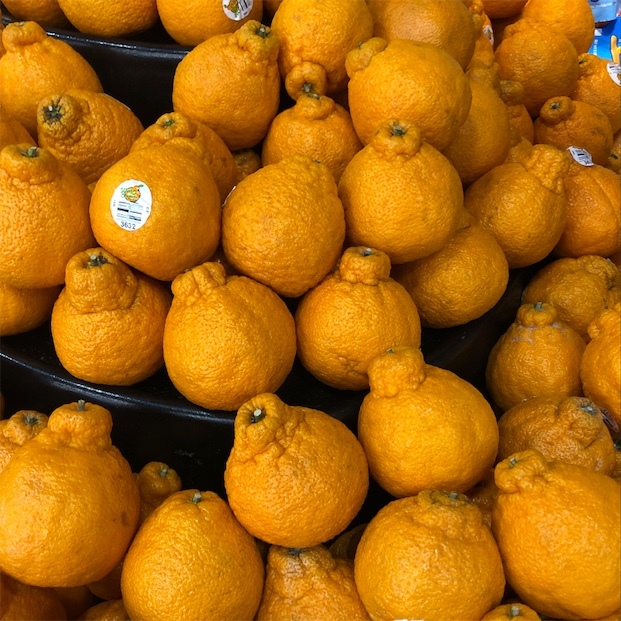 Sharer's comments : SUMO CITRUS® spotted at HEB Texas City. 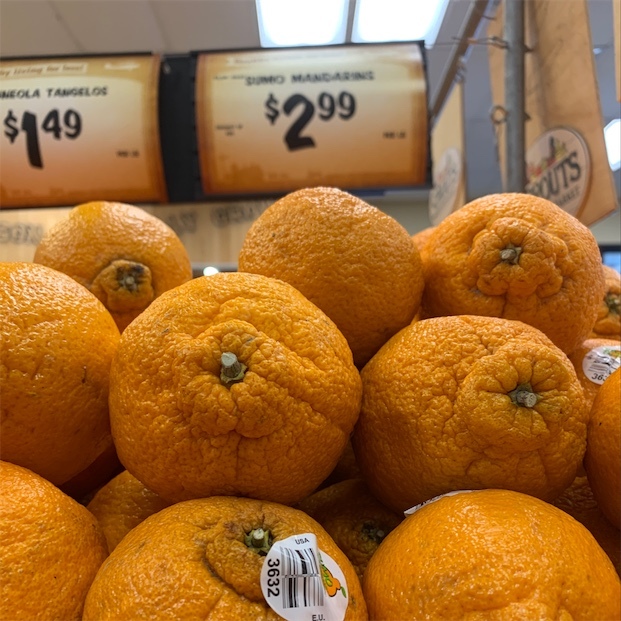 Sharer's comments : SUMO CITRUS® spotted at Ralphs. Sharer's comments : Fresh from California! 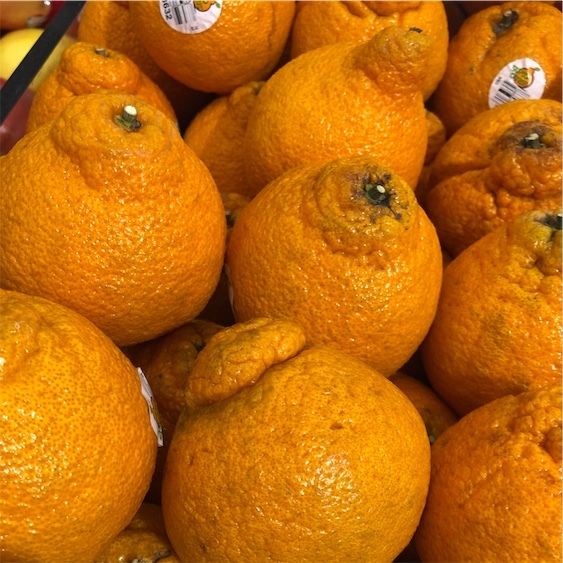 Sharer's comments : SUMO CITRUS® spotted at vons . 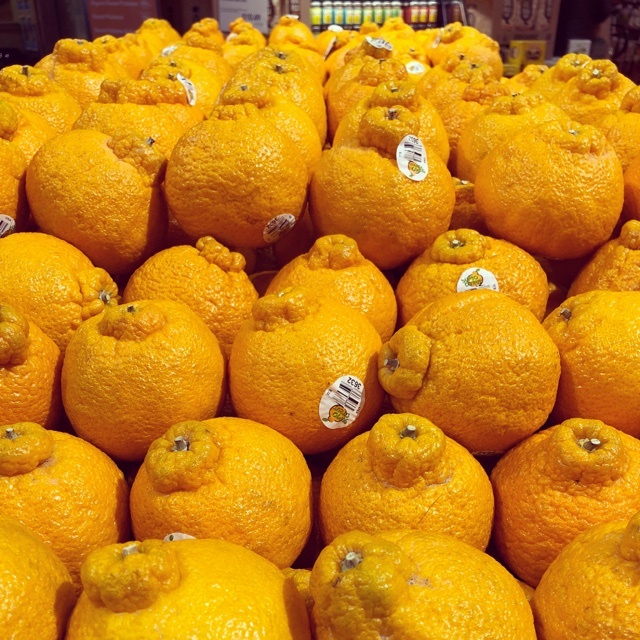 Sharer's comments : SUMO CITRUS® spotted at Nijiya Market. Sharer's comments : Fresh new crop Sumo Citrus ! 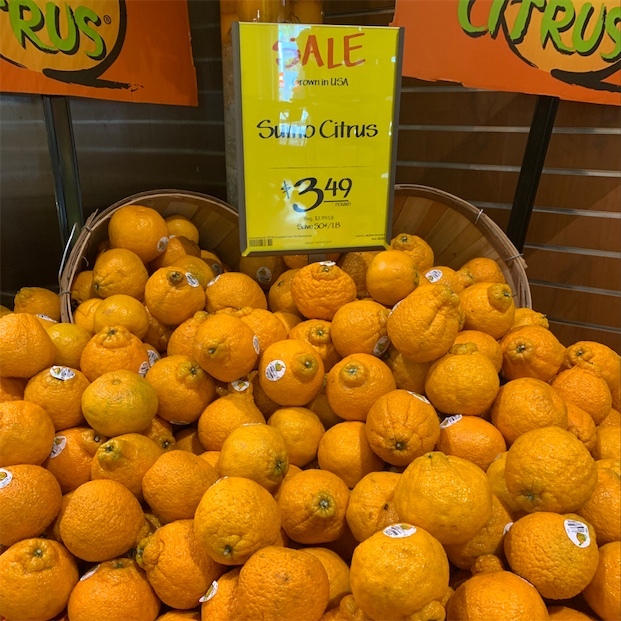 Sharer's comments : Sumo Citrus are in season for a short period! 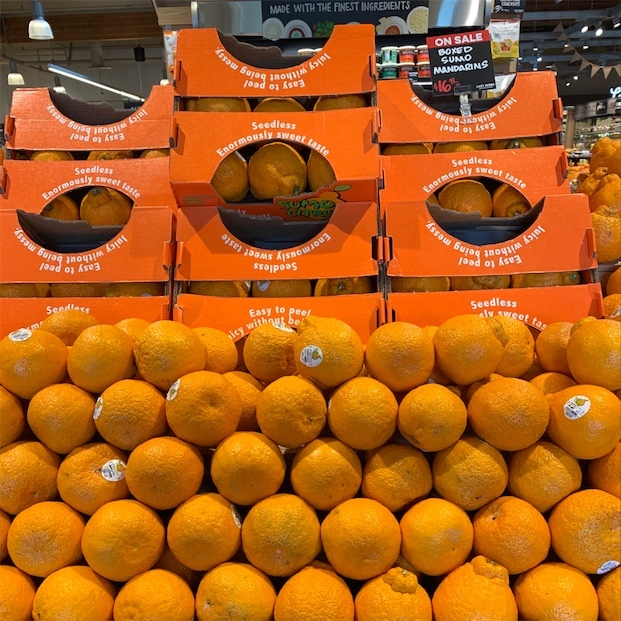 Sharer's comments : SUMO CITRUS® spotted at Pavilions Melrose and Vine . Sharer's comments : SUMO CITRUS® spotted at Pavilions Burbank Ca. 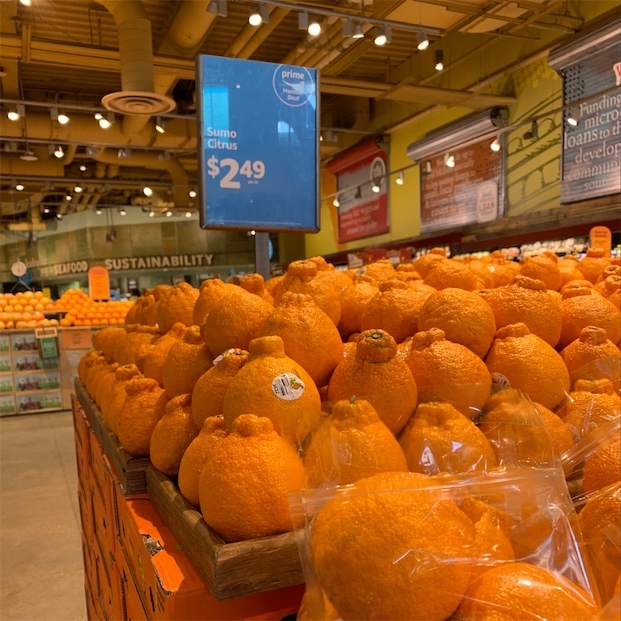 Sharer's comments : SUMO CITRUS® spotted at Whole Foods Market. Super easy to peel, seedless, extra juicy and amazingly sweet! 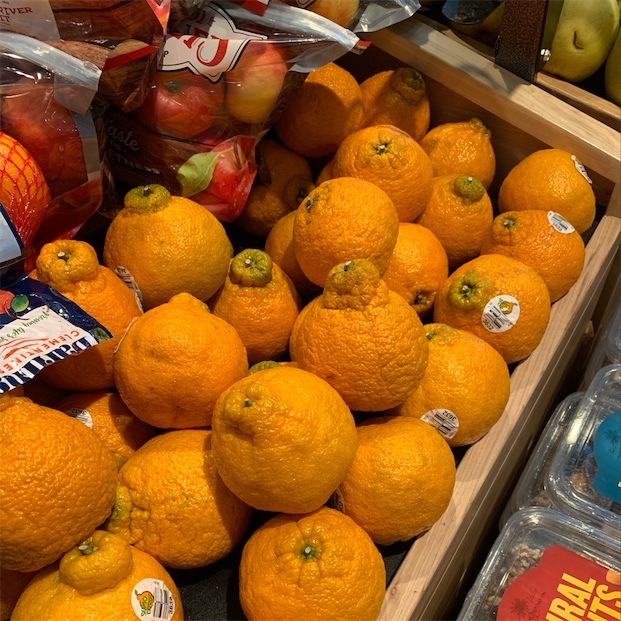 Sharer's comments : SUMO CITRUS® spotted at Fred Meyer Medford Oregon. 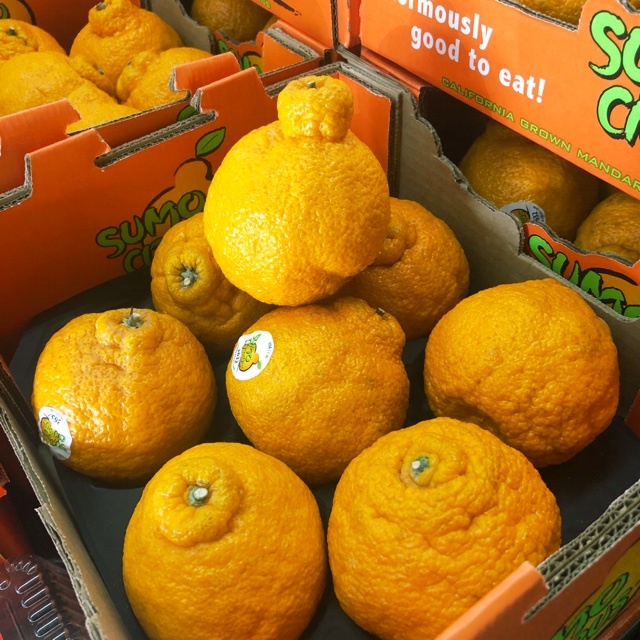 Sharer's comments : SUMO CITRUS® spotted at Specialty Produce.